Welcome to Tommy's Pack Fillers, (now incorporating the Boer War 'Q' store), specializing in the finest museum quality British Great War period reproductions for the discerning First World War living historian, WW1 reenactor or collector. Limited edition Great War period repro items as supplied to museums, enthusiasts world wide and as WW1 props for motion pictures, TV films and WW1 period theatrical productions. Limited edition WW1 replicas - When they've gone they have gone! Please visit our frequently updated GALLERY, displaying the finest WW1 period repro items. 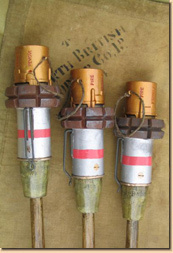 Cast resin copy of the original No.1 Mk 1 Grenade (1914) Royal Laboratories grenade. Highly detailed percussion head, fragmentation band, explosive cylinder and wooden block.